Learn about activities, courses, clinics, seminars, events, and lodge stays—what they are and how we define them. Get a quick overview of how to schedule them and links to in depth how tos for scheduling and managing them. A standard trip where we explore the Pacific Northwest by foot, kayak, snowshoe, or ski. Participants might learn something, but there is no direct educational component. Registration and signed waiver are required. Rosters must be updated and the activity closed when complete. All trips are in the Find Activities search. 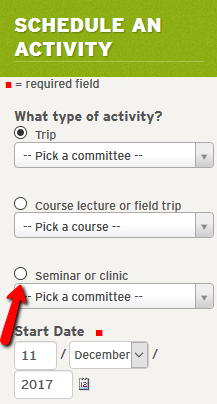 Activities for which you are registered (participant or leader) are listed on your profile's My Activities page. We use Routes & Places as the starting point for adding all our activities—trips, clinics & seminars, and course lectures & field trips. Need a new one? Review How to Request New or Updated Routes & Places to learn all about Routes & Place and how to add one. Found a route/place that needs updated or could be improved? Have new images or resources to add to an existing route/place? Please complete the Route/Place Updates, Images & Resources form. A one-day or one-weekend, skill-based activity like learning how to roll a kayak or refreshing steep snow climbing skills. They are connected to a route/place to prevent conflicts at that location. All clinics and seminars are in the Find Activities and Find Courses, Clinics & Seminars searches. Clinics or Seminars for which you are registered (participant or leader) are listed on your profile's My Activities page. Includes more than one course-related activity like lectures, workshops, field trips, and practice sessions. If your course is only one day then it should be listed as a clinic or seminar! Ability to manage students, graduates, equivalency candidates, and equivalents. All courses are in the Find Course, Clinics & Seminars search. Courses and their activities, clinics, and seminars for which you are registered (student, graduate, leader or instructor) are listed on your profile's My Courses page. Generally in-town, inside, sit down, meet, discuss, watch. Meetings, film festivals, and general audience seminars. Are NOT set up to process money. We can use Eventbrite for ticket sales if your event has a fee. Contact Garrett Arnold to set this up. Events are added to a program center or branch calendar. Find events on our site-wide, branch, and program center Upcoming Events page. You can download events to post to your own personal calendar (iCal and vCal formats). Events for which you RSVP (participant or event contact) are listed on your profile's My Activities page. Want to schedule an event? Go to the event calendar page where you want your event to happen and choose "Event" from the "Add New..." menu in the the yellow admin bar. Use these quick calendar links to schedule your event! Listing an event sponsored by the Seattle Branch or Tacoma Branch that isn't at a program center? Add it directly to the Seattle Branch Calendar or Tacoma Branch Calendar. A overnight stay at one of our three lodges: Baker Lodge, Meany Lodge, and Stevens Lodge. They have a fee structure for members and non-members, and adult and youth. You may add as many guests to your reservation as desired regardless of whether the guests have accounts on our website. External groups and internal groups for our courses, clinics, and seminars are welcomed by our lodges. Visit our lodge pages (links above) for more information about booking your group's stay.